Chelsea is your shoulder-swinging mobile office, make-up counter, secret compartment min-bucket bag companion. The top compartment is lined with six organizing pocketes for everything quotidian and necessary: mints, keys, wallet. She's got a super protected external pocket for quick, no-digging-around phone access. Down below is the secret, zippered Aroma-Bloc™ compartment where the party really happens. 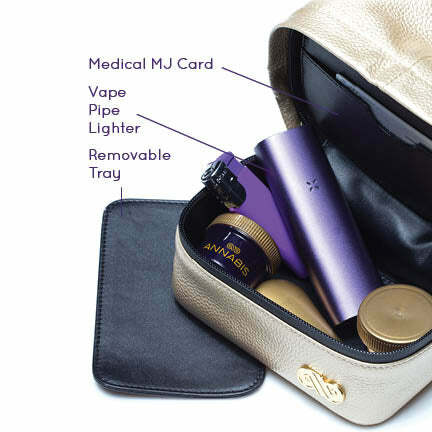 Bottom Aroma-Block™ compartment with medical card slot and removable tray. NOTE: Zippers are very tight. This is intentional to confine odors.